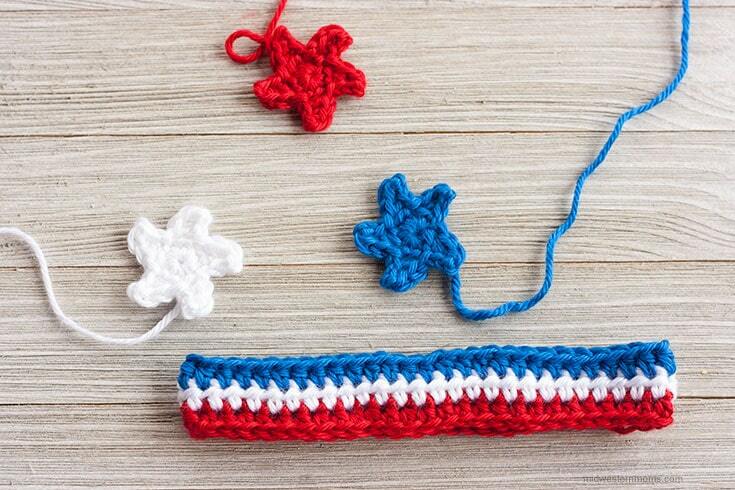 How about a cute little crochet headband to help celebrate Memorial Day and 4th of July? 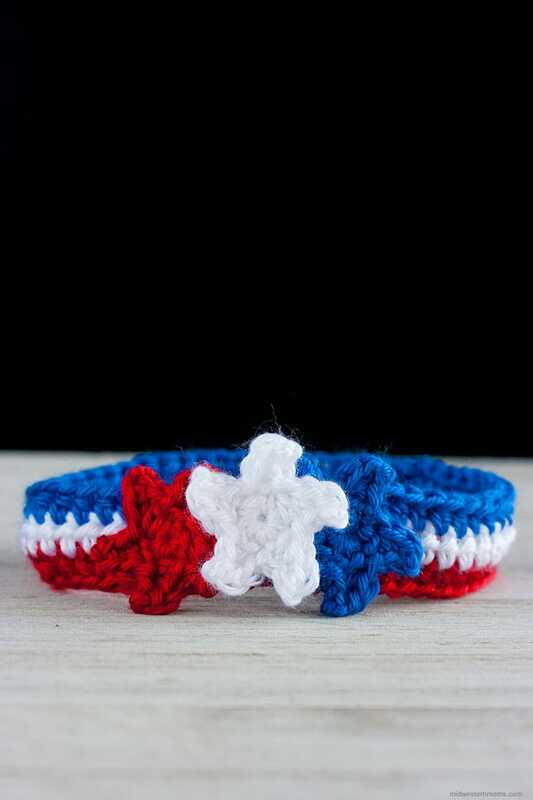 This patriotic crochet headband with stars is perfect to sport your red, white, and blue colors. 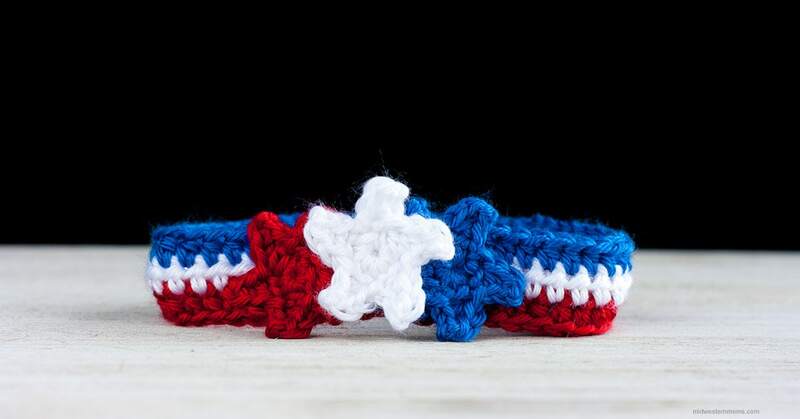 Since Memorial Day is coming up quickly, I decided to create a beautiful crochet headband that featured crochet stars. The first set of stars I created ended up being too large for a headband. 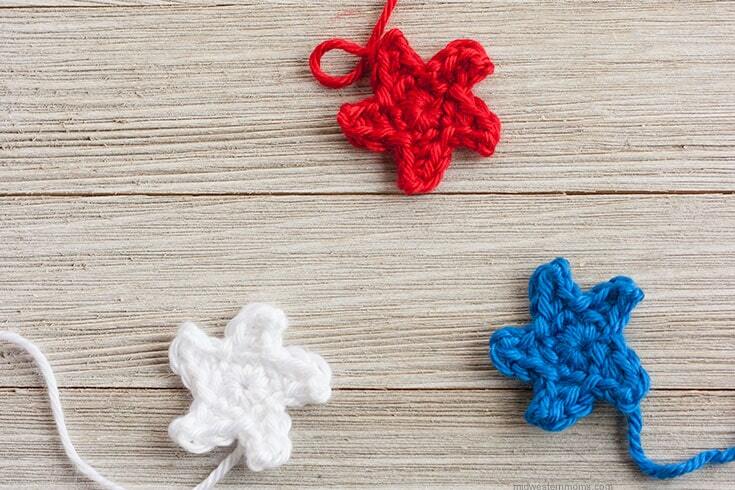 If you want a larger star (about 3 inches), follow the link to crochet stars. The larger stars may be better suited for adult headbands. The headband pictured is in the newborn size. I try to base all my headband patterns on that size so they don’t appear overly huge on babies. I always use a soft yarn when creating headbands. Most of the time, I use Caron Simply Soft Yarn. It is soft and has a beautiful texture. I used Caron Simply Soft Harvest Red, Royal Blue, and White. Another thing you will want is a measuring tape. It will help you get the correct size for your headband. These are how long the band is from end to end before sewing it together to make a circle. Please double check your band length. Everyone crochets a bit different so measure before moving on. This is for a newborn size, but feel free to modify the pattern to make the other sizes. Start with the magic circle. Chain 1. Single crochet 9 stitches. Close up the magic circle enough to slip stitch to join. Repeat from * to * until you have 5 points on your star. Slip stitch the last point at the start of the first point. Cut your working yarn. Pull your magic circle tight. Leave this tail long to use for sewing on to the band. Weave in your working yarn end. Make a total of 3 stars in each color. Row 1: Using Harvest Red Yarn – Chain 55 (make sure you measure to double check your length). Half Double Crochet into the third stitch from your hook. Continue to Half Double Crochet across. Row 2: Change to White Yarn – Turn your work and Chain 2. Half Double Crochet in each stitch across. Row 3: Change to Royal Blue Yarn – Turn your work and Chain 2. Half Double crochet in each stitch across. Cut your yarn and sew your band together. Weave in any ends you may have. Arrange your stars how you want them on the band. Using the long tails of yarn and a yarn needle, sew the stars onto the headband and it is complete. Want to be able to print this pattern? Put your email address in the box below and an email will be sent to you with the link.